Bonnie Blake, originally from Louisville, Kentucky started her career as a camera assistant in New York City on music videos, commercials, and documentaries including “Paris is Burning”, features like “True Love”, “Mr. & Mrs. Bridge”, “The Long Walk Home” and the television series “The Days and Nights of Molly Dodd”. She had studied English and theatre in college graduating from Vanderbilt University with her Bachelor of Arts and the University of North Carolina at Chapel with her Master of Fine Arts. She moved to New York to pursue a career in theatre but then discovered photography. This lead her to combine her interests and pursue a career in cinematography. She took a summer intensive cinematography class at New York University, hands on workshops offered by her union as well as classes at the Maine Media Workshop. After moving to Los Angeles in 1991, her camera assistant credits included “Leaving Las Vegas”, “These Girls Are Missing” a UN documentary shot in Malawi, Africa and “How Stella Got her Groove Back” which was shot in Los Angeles and on location in Jamaica. She spent six weeks working in France as the camera assistant on the feature film “Never Ever”. She moved up to become a union camera operator in 2000 and continued working primarily in features and episodic television. Her credits include “The Agency”, “Monk”, “CSI:New York”, “Hawthorne”, “Bunheads”, “The Goldbergs”, “Single Ladies” “Being Mary Jane”, “Insecure” and “Doubt” and “The Kominsky Method” which will start streaming on Netflix this October 2018. She has also been fortunate to work on many TED conferences (for the website www.TED.com) shot in California, Canada, India, Scotland, and England. This past August she was the Director of Photography for TEDGlobal in Arusha, Tanzania. She is a member of the International Cinematography Guild of IATSE Local 600 and is currently a camera operator representative on the National Executive Board. 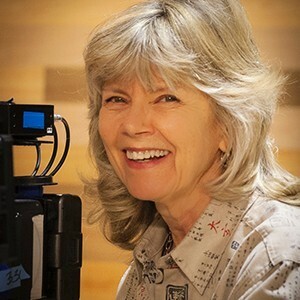 She is also on the Board of Governors of the Society of Camera Operators. She is co-founder of Camerawomen Los Angeles for established and up and coming women who are working in non-union and union camera positions including Directors of Photography, camera operators, assistants and still photographers. A complete work resume follows. She has taught at the Hollywood Cinema Production Resources program at West Los Angeles College and a various IATSE and SOC workshops.